Labour is calling for technical universities to be created as part of a blueprint for reshaping the higher education system to support a hi-tech, high-income economy. 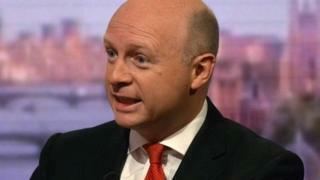 Shadow universities minister Liam Byrne says he wants more options for young people than traditional degree courses. Technical universities would be partnerships with industry and would support local enterprise zones. "Unless we get smarter as a country, we will get poorer," said Mr Byrne. "We've got to build a bigger knowledge economy, home to better-paid jobs and open to anyone with talent, no matter whether they want an academic or a technical path in life," said Mr Byrne. But a Conservative spokesman dismissed the proposals as "political posturing". Mr Byrne said the university sector should be aligned with the needs of a globalised, digital knowledge economy. He called for closer links with industry and more investment in research hubs. Mr Byrne said there needed to be a "variety of ladders" into higher education, moving beyond three-year academic degrees. This could include developing "learn-while-you-earn" courses, which would allow people to upgrade their skills while still working. There could be more use of online courses, such as the so-called Moocs (massive open online courses), in which universities put course material online, said Mr Byrne. "We need to think more radically about how we provide access," he said. The traditional model of a three-year academic degree "doesn't work for some young people". Mr Byrne also raised the idea of a "student premium" that would provide a financial incentive for universities to recruit students from disadvantaged backgrounds, in the way that schools get extra funding from a pupil premium. Setting out higher education as a key political battleground, Mr Byrne said universities were critical to any economic ambitions to have "more high-skill, more high-wage jobs and fewer low-skill, low-wage jobs". But Mr Byrne's proposals, put forward in a pamphlet for the Social Market Foundation, do not tackle the controversial question of tuition fees. Labour leader Ed Miliband has previously spoken of reducing fees to £6,000. The Russell Group of leading universities supported Mr Byrne's calls for more investment in university research. But it rejected any major changes to the current mechanism of funding and fees, saying that the system was working. Its director-general, Dr Wendy Piatt, said: "In the face of significant public funding cuts, it has helped Russell Group universities in their commitment to providing a world-class education and it has supported all students, whatever their background, to access higher education." Prof Steve West, chair of the University Alliance, said that "access is not just about getting young people into elite universities" and that already there was "positive work that is going on right across the higher education sector". Prof Michael Gunn, vice-chancellor of Staffordshire University and chair of the Million+ group of modern universities, said: "A challenge has now been set for other political parties clearly to outline the key areas they want to address in higher education and to begin work with universities in exploring them." A Conservative spokesman said: "This is just political posturing from Labour. They did nothing for 13 years to broaden higher education, neglecting apprenticeships and presiding over a growing gap between rich and poor in access to university. "In contrast, this government is taking the necessary decisions to make sure Britain's higher education system remains the envy of the world - and equips our young people with the skills they need to succeed in life. "We've launched apprenticeships that are every bit the equal of a degree and all the while abolishing the cap on university places. "Once again Labour have no new ideas - just a cosmetic attempt to paint over their woeful record in government."